As the successor of the RGM-79 GM series, the Jegan is the new mass produced mobile suit of the Earth Federation. The suit is lighter and more maneuverable than all the previous GM units, although it is not as well armed as the RGM-86R GM III. Nevertheless it performed very well and thus it was put into mass production. 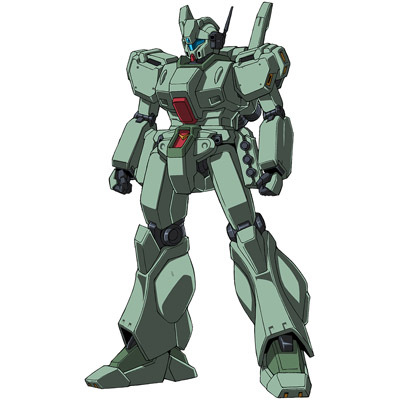 As a mobile suit based on the GM series, the Jegan's design focuses more on being easy to use, easy to maintain, and possessing a high cost-effectiveness. Because of the size of the Earth Federation Forces it was imperative to possess a mobile suit that could be easily used by a wide range of pilots, and used a wide set of common mobile suit parts that could be quickly and cheaply replaced. For weapons the Jegan was equipped with a beam saber stored in a waist recharge rack and a waist mounted three-tube hand grenade rack. It was also equipped with the optional armaments of a head-mounted vulcan gun pod, a forearm mounted shield that had two 2-tube small missile launchers, and a beam rifle or a bazooka. As the Jegan remained in service over the years, it received periodic technological upgrades, producing a large number of variants.